It is said that history is written by victors. The conventional account of 1990s Crypto Wars is an epic struggle pitting the software industry against the Clinton administration over use of strong cryptography in commercial software. At the time such products were curiously regulated as “munitions” and subject to ITAR (International Traffic in Arms Regulations) in much the same way as selling a Stinger missile. Concerned about the implications of strong cryptography and intent on keeping it from falling into the wrong hands, the administration favored an escrowed encryption standard. This envisioned a world where users could have their strong cryptography with one caveat: a copy of the secret keys protecting the communication would be made available to law enforcement. This notion of key-escrow became the flash-point in a contentious debate. Industry argued that such handicaps would greatly disadvantage US products in global markets, since competing offerings from European and Asian firms faced no such restrictions. The unusual alliance of civil libertarians, first-amendment proponents, cypherpunks and commercial interests won that argument. The Clipper chip proposal for implementing the EES standard went nowhere, the administration backed down and most vestiges of export controls were gone in a matter of years. Fast forward to today, key escrow is back in more subtle and insidious ways. The next chapter of the story stats out innocuously with Microsoft introducing BitLocker full-disk encryption with the ill-fated Vista release of Windows. Designed to leverage special tamper-resistant hardware called Trusted Platform Module (TPM), BitLocker provides encryption for data at rest– a valuable defense as data breaches resulting from theft of laptops are on the rise. Windows 7 extends the underlying technology to also protect removable drive using a variant called BitLocker-To-Go. Ownership: This is controversial but many enterprises state in their acceptable use policy (AUP) that data residing on company issued hardware belongs to the company. (Note that the bring-your-own-device or BYOD model muddies the waters on this.) In that sense the data-owner is not the individual employee but the enterprise and it is their decision to escrow keys with the IT department. Threat model: IT staff operating the Active Directory system already have administrator privileges on user machines and can execute arbitrary code. Users can not have privacy against their own IT department under any realistic threat model of a managed environment. In that sense key-escrow to AD does not introduce any additional privacy risk: the escrow agent was already in a position to read all data. 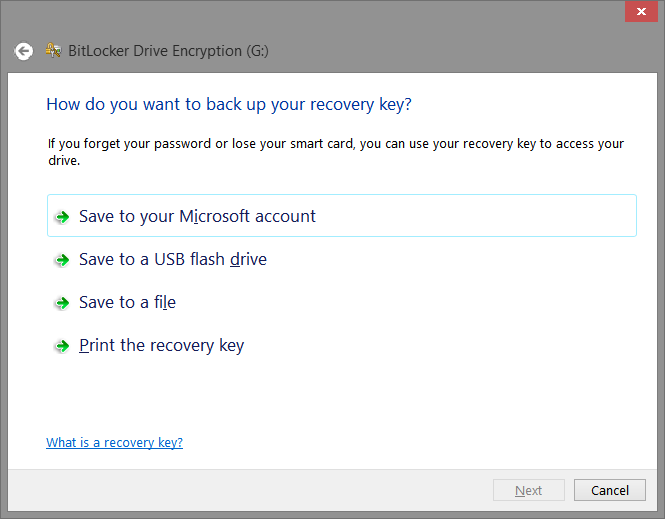 Windows 8 introduced a new option for BitLocker recovery keys, displayed prominently as the first choice: save to your Microsoft Account. That means storing back-up keys on Microsoft servers, with access gated by the MSFT online identity system, also known by past names .NET Passport and Windows Live. By authenticating with the same identity in the future, users can retrieve the keys from the cloud if they need to recover from a key loss scenario. In other words, key-escrow to Microsoft. This is arguably the most reliable way to back up keys. It also happens to be the most opaque one and fraught with privacy questions. When keys are printed out on hard-copy or saved on USB drive, they are still in physical possession of the user. That does not mean they are immune to risk– pieces of paper can be stolen, files stored on a machine can be pilfered by malware. Yet these risks are visible and largely under the control of the user. For example if the user happened to save recovery keys on a thumb drive, they could choose to put that object into a safety deposit box if they were sufficiently paranoid. By contrast when keys are uploaded to the cloud, the chain of custody goes cold. The cloud service is a blackbox and users have no way to ascertain what is going, how keys are stored and if anyone else has been given access. Unlike the enterprise scenario, the escrow-agent is not the data owner in this case. Microsoft is the provider of the operating system. There is no expectation that any user data stored on that machine must be accessible to the vendor providing the software. There are additional privacy risks introduced by electing this option but it remains just that– an option. Each user can weight the options and decide independently whether the added reliability merits such risks. Windows 8.1 will not be released until October but developer previews are already available. Judging by preliminary information on MSDN, Bitlocker “enhancements” for Windows 8.1 and Windows Server 2012 R2, this release ups the ante. Key escrow is enabled by default on consumer PCs. Unlike a standard BitLocker implementation, device encryption is enabled automatically so that the device is always protected. If the device is not domain-joined a Microsoft Account that has been granted administrative privileges on the device is required. When the administrator uses a Microsoft account to sign in, the clear key is removed, a recovery key is uploaded to online Microsoft account and TPM protector is created. Remembering that “not domain-joined” will apply to most consumer PCs for use at home, this translates to: for any Windows 8.1 machine that happens to have requisite TPM hardware, BitLocker disk encryption will be enabled with recovery keys escrowed to MSFT automatically. Why is this significant? One could counter that it is merely an opt-out setting users are free to override if they happen to disagree with MSFT policies. But it is well-known that choice of default settings made by the application developer are critical. Majority of users will accept them verbatim. Behavioral economics literature is full of examples of crafting default options to “nudge” the system overall towards a particular social outcome, without overt coercion applied at individual level. There is nothing wrong with offering an option for cloud escrow. But making that an automatic decision without giving users upfront notice and meaningful chance to opt-out is disingenuous. It is particularly tone-deaf given the current post-Snowden climate of heightened awareness around privacy and surveillance. Allegations around US government surveillance have raised questions about the safety of personal information entrusted to cloud providers. Such accusations are expected to cost the industry billions of dollars in lost revenue as customers curtail their investment of resources in the cloud. I’m not entirely sure I see the problem – you may store the key with Microsoft but they don’t have access to the actual data. As you’ve already been through in some detail you can’t bitlocker encrypt data you store in skydrive. This actually sounds like a good idea to me – what am I still missing? You are right, under normal circumstances the cloud service does not get the encrypted bits. They only get the recovery key that can be used to decrypt them. This post is pointing out it creates additional attack risk, because Microsoft becomes another avenue for getting the key *once* someone gets hold of your device. A common example is when your laptop is stolen. With TPM or smartcard they would have to defeat a local PIN that is checked by tamper-resistant hardware. With key-escrow to the cloud, they could also recover the key from Microsoft account. There are many more options for attacking a remote ID system. For example they could try to reset your password; that will not invalidate recovery keys. In the context of the State accessing data, it becomes a more complex legal question. Debate continues around whether 5th-Amendment to US constitution protects users against being compelled to reveal decryption keys to their data. But there is no question that it is perfectly acceptable process to request recovery keys from Microsoft and decrypt the data without any user involvement. I would like to suggest that you do not save the recovery keys at all. Make them vanish safely right away. The situations in which one would use the recovery keys are then equal to a total break down, or theft, of the computer&disk. Put your energy in being prepared for that. What if you do need it to get back in your system? If you play with hardware much, you will be annoyed by win 8 installing digitally signed drivers only. All your older and not-digitally signed drivers are rejected even without windows showing you the red dialog. Then you follow a tut to disable the digitally signed driver feature at startup, only to find out that your encrypted hard drive needs the recovery key. You need a paper copy for that. Clearly Henk has never had a TPM fail, forcing the recovery scenario, or changed the default system language which results in the same situation.